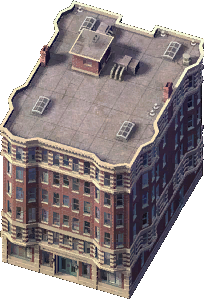 This variant of Small Condos may be based on the South Main Street frontage of the Gayoso Hotel in Memphis, Tennessee. The recreation has been built as a standalone building, so it is shortened and the front of the building is mirrored to the rear. The bay window structures on the front of the building have also been added onto the sides of the recreation and the ground floor of the building is different. This page was last modified on 10 May 2015, at 05:26.